We drive up to the Hotel Der Paternwirt, for our gathering. 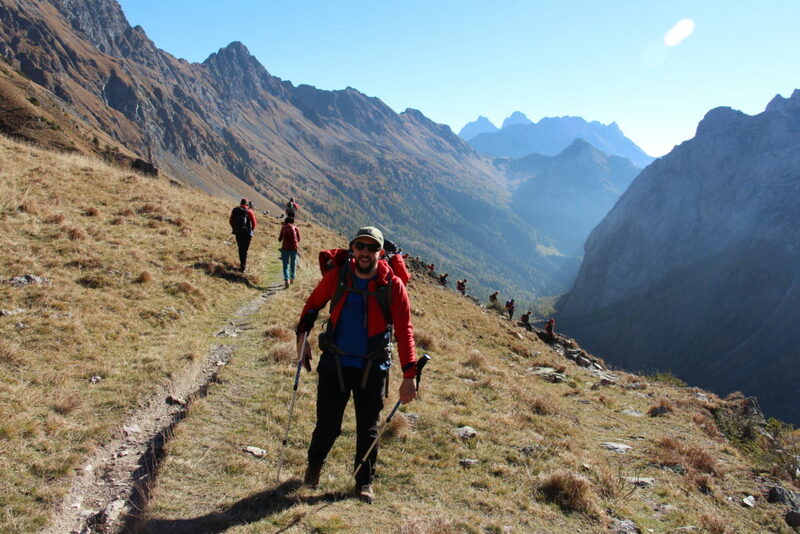 A total of 20 contest winners from Germany, Austria, Switzerland and the Netherlands are meeting up for their hike in the Alps with alpinist legend Gerlinde Kaltenbrunner. Joining us are two very excited Schöffel staff members, who are tasked with capturing this event and arranging the trip to go smoothly. I’ve traveled from my home in the Netherlands all the way to Maria Luggau, for I wouldn’t miss this for the world. The group is diverse, with climbers, hikers with much or little experience. Yet, one thing brings them together and that is a love for the outdoors and the mountains. During the early breakfast, Gerlinde joins us. Having just finished her book (‘Mountains in my Heart’, the English translation) last night, I find myself staring for a moment. As she casually joins the company with a cup of tea and her breakfast plate, I go through her background. Gerlinde Kaltenbrunner started out as a nurse, but her passion for climbing brought her to new heights in climbing the great peaks of this world. Making great sacrifices for her dream, she became a professional mountaineer and the first woman to climb all 8,000+ peaks, without supplemental oxygen. A feat, that sets you apart as an athlete and human. But here she is, dining among us mortals and making everyone feel perfectly at ease with her warm words and friendly smile. She is, however, the first person ready to go. Packed up to start into the mountains and see this part of her native country for the first time on the Karnischer Höhenweg. We seem to be a whole group of morning persons! As the buses depart for our starting point, my watch switches to 7.31. It will turn out to be this way for the whole trip and due to its smooth organization and the efforts of all my fellow travelers, it’ll be the last time I check for the time. As we arrive down in the valley we stand in the shadow of the mighty Alps. The rock face is kissed by the early morning sun rays and though the air is cold, the sky is clear as we start walking. Bergführer Jan at the front, and Mario at the back, herding the group towards the Hochweißsteinhaus. Eagerly we stop to take pictures of ourselves and each other. “Can you take a picture of my kids?” my fellow Dutch participant asks. Her two sons came along for the ride and are waving at us from the distance, going on their own adventure. Apples rarely fall far, do they? Our guides check up on us often, but so do Tereza and Miriam from Schöffel, who are as happy as any of us to be out here. The slogan of the outdoor brand really comes alive in them. “Ich bin raus”, and all is well! After a sturdy climb, we see a hut emerge on the top of the hill. At the Hochweißsteinhaus, we are received with hot tea or fresh drinks. We enjoy the moment as the sunrays come over the edges of the heights and start providing additional warmth. It’s a moment to take some pictures of the beautiful valley below us, but this is just a short break and after gathering our lunch packages from the hut, we get ready to depart. The mood has become quite jolly and the shot of schnaps at our departure gives us the courage to continue the steep ascent as we shake innkeepers hands. That it’s not just a lovely stroll in nature becomes clear soon, as Jan and Mario tell us about the history of the region and the fierce fighting that took place here during the first world war. “More people died in climbing accidents than in actual fighting!”, Mario informs us with his by now familiar smile and penchant for jokes. It’s not the last bit of history we’ll hear of or will see as we cross the border into the Italian Alps. We pass through thick pine forests, over wind-blown hills and rough, pebble-strewn paths. As we get used to the peace and quiet, we are suddenly shocked by the sound of engines as a group of trail bikers approach us. 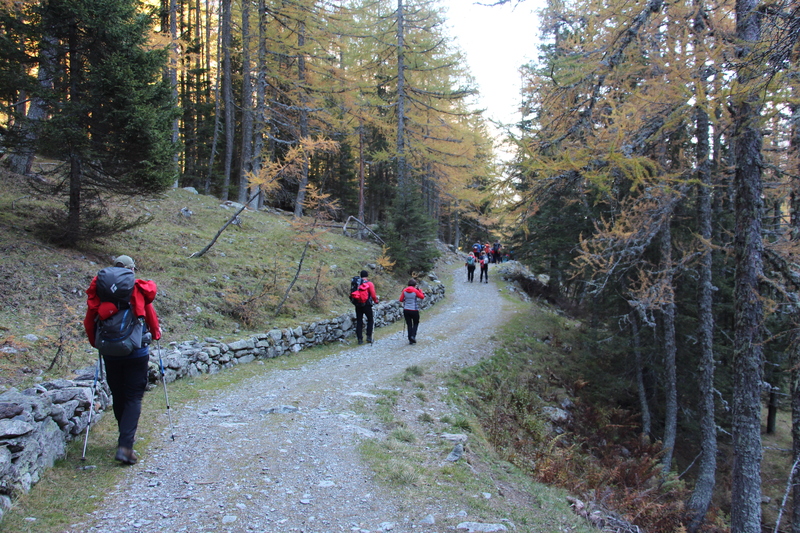 There are many ways to enjoy the mountain, but in general the quiet is what our group of walkers enjoys most. It is fascinating to learn what it means to be a bergführer here and that’s no walk in the park. An exceptional knowledge of the mountains, rescue techniques, flawless climbing skills and knowledge of nature and history, is what Mario describes. He forgets to mention a lot of humor, which he and his colleague display as often as possible. “But to be able to live in this paradise every day…”, one fellow traveler mutters, gazing up at the looming mountainside to our right as we approach our next ascent. 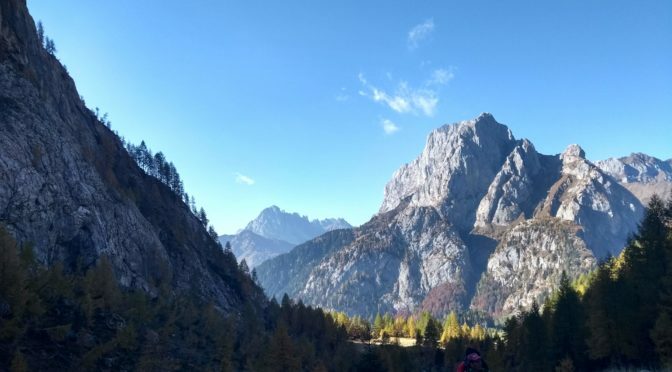 This one turns out to be our most daunting yet and a good hour of climbing upwards leads us to a plateau from which we get the most stunning view as we enjoy our lunch. Many of us in silence and awe of our surroundings. As we start walking again after a sturdy lunch, Gerlinde falls in behind me: “Are you doing ok?” I answer that I am, but that I’m simply in awe of it all as this is my first Alpine experience. She looks taken aback for a moment. 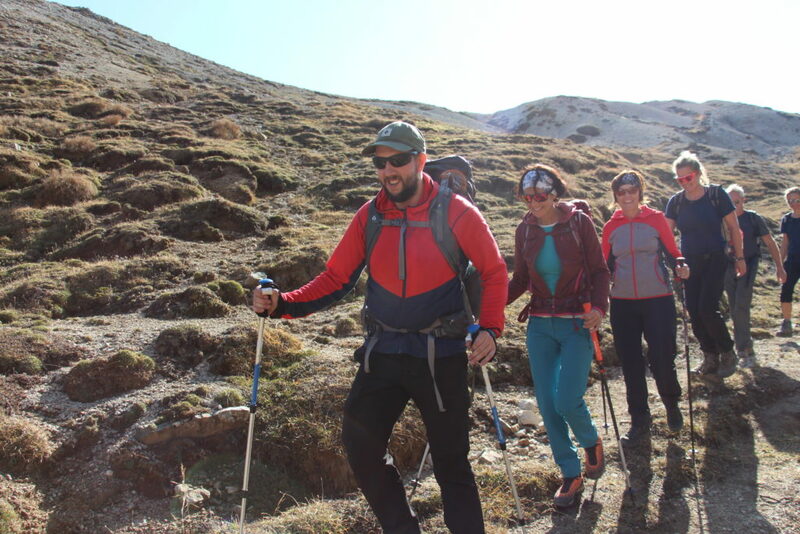 Our short chat is interrupted as another traveller starts talking to the Alpine legend and Schöffel ambassador, but a moment later as we stand still on the slopes of one of the peaks, gazing down at the peaceful lake below she says to me: “Beautiful isn’t it?”. I don’t know what to say and just nod. Sensing my discomfort she continues with the compliment that puts a spring in my step for the rest of the day: “Du steigst sehr gut!” You can bet that I’ll tell my mom that Gerlinde Kaltenbrunner said that to me! 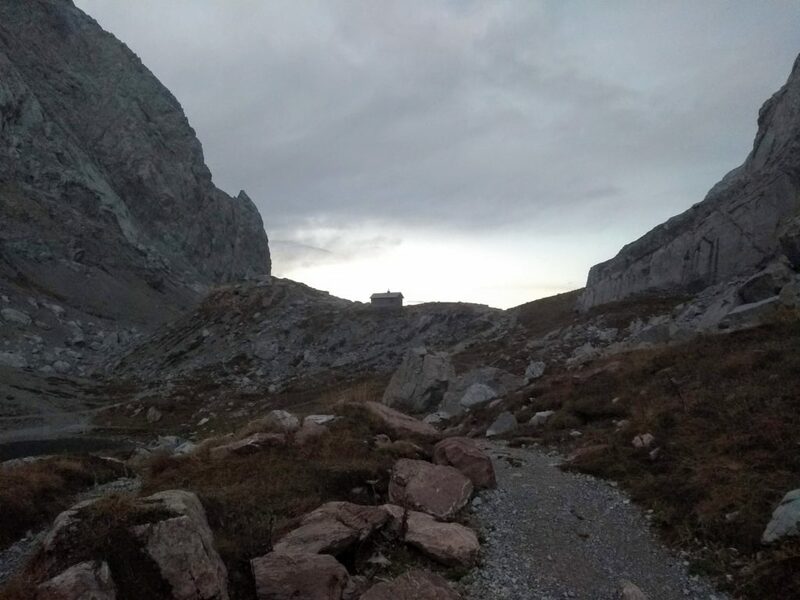 I continue the rest of our journey, including a steep descent and a rocky field, with all the motivation I need up till the point that we turn around a corner and see the Wolayerseehütte in front of us. We are greeted by innkeeper Helmuth, who is a personality full of wit and energy, with an intensity that is hard to match. It turns out, that he and Mario are old friends, who meet Gerlinde in the basecamp of years ago. No wonder that our evening soon becomes a joyous occasion, reminiscing old stories and singing songs with Helmuth’s son Stefan contributing significantly. “So, was spricht man denn in Holland?”, Helmuth asks me. I explain it’s Dutch. “Ah, Flemish?”, he follows up. He’s pulling my leg, and not for the last time this evening. The food is splendid and the facilities perfect for our company. No luxurious nonsense, but comfort and warmth, that’s all we need. A good glass of beer or wine makes this a remarkably pleasant evening, where we share and connect to each other. As we can’t connect to any wifi or mobile network, no phones are hampering our interaction and soon it feels like a night of meeting old friends instead of random travel companions. It’s hard to say at what hour the singing actually ends. As we crossed the border back into Austria again yesterday, we are at the Wolayersee merely a few hundred meters away from the border. Since I’m up at 6.30, way before breakfast, I grab my Schöffel down jacket and pants and head out of the door of the still sleeping hütte and walk towards the border. A small stone with an ‘I’ and an ‘Ö’, marks the border and there I watch the sunrise. After a fulfilling breakfast, we leave ahead of time for our final hike of the day. Bergführer Jan enthusiastically shows us the rich geological formations and fossils in the rocks that are strewn in our path. Mario tells me about the sniper nests and barbed wire I see, which fills me with amazement about the ground I’m walking upon. The day is colder and in the shadows of the Alps we slowly descent towards our last stop on this journey. 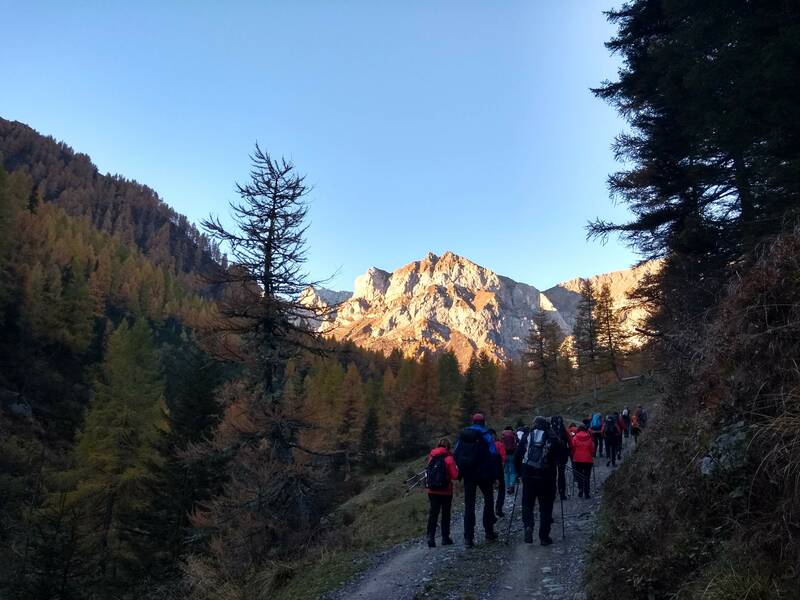 We see a group of climbers gearing up for the Klettersteig on the big walls here and on this part of the journey, we learn more about the climate changes and effect on this region. 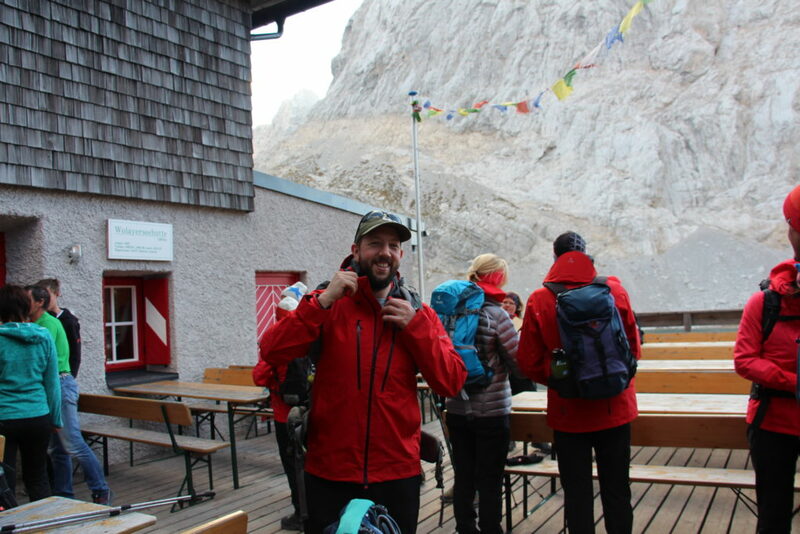 After a long descent, we arrive at Untere Valentinalm, where we are served a sturdy meal, made for mountaineers. Tired, but very happy, it’s a moment of smiles and exchanges as we enjoy the great food and company for a short while longer. Soon we’ll board the bus and head back to the hotel. I silently gaze out of the window at the peaks around us, as the bus navigates the narrow mountain roads. As we say goodbye, Gerlinde tells me, what I already feel in my heart: “I hope you enjoyed this as much as I, but when I look at you I see you will be back here.”. She’s right, because how could I not fall in love with this beautiful region and the mighty mountains that fill its skyline. Pictures are my own or provided kindly by Schöffel, who made this trip happen. I’ve ventured to share no footage depicting others, but if you somehow feel you are unjustly displayed, let me know and I’ll remove it. Find out more about Gerlinde on her website.